Color(ed) Theory, a series of photographs of abandoned houses on Chicago’s South Side painted bright colors, was one of the Chicago Architecture Biennial’s most persistent viral images. Chicago Works: Amanda Williams—its sequel of sorts—constitutes a passing of the torch. The show, which opened this week at the Museum of Contemporary Art (MCA) in Chicago, represents architect and artist Amanda Williams’s first solo museum show. 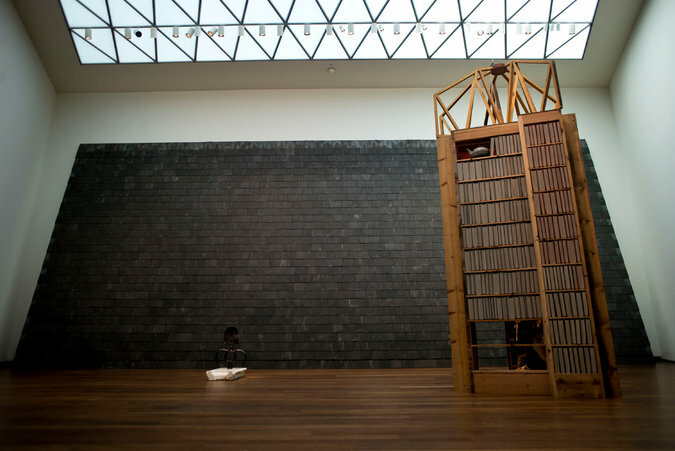 The MCA gave artist and urban redevelopment innovator Theaster Gates his first show in 2009, and because Williams and Gates’ work share common ideas, comparisons are inevitable. Gates and Williams are both African-American artists living and working on Chicago’s South Side, whose art focuses on cycles of disinvestment (cultural and economic) and the rebirth in African-American communities. They’re both trained as designers—urban planning for Gates, architecture for Williams. Their work is similar in subject matter and in its use of reclaimed wood, brick, and other detritus of urban decay. Today, Gates is a globe-trotting, multi-national art brand, and his expanding empire is getting entrenched in some of the same issues of institutional cultural ownership that his work has critiqued. As his banner rises, can Gates really represent Chicago—a city notoriously cagey about those who find more success anywhere else, especially given Gates and Williams’ hyper-local grounding in community activism? And if not, does that leave an opening for Williams? As Williams says in a video included in the exhibition: “I know these streets. I know the politics. I know the gangs. I know people that have never left the block.” These are all things she must know in order to operate under the broad umbrella of “social practice”—a genre of art which prizes both DIY unsanctioned interventions, like her painted houses, and engagement with municipal bureaucracies. In Chicago Works: Amanda Williams, organized by MCA curatorial assistant Grace Deveney, we get a chance to look at an artist trained in architecture and urbanism, unabashedly working with color that’s usually bright and monolithic. (The paint for her abandoned houses were colors associated with the advertising of African-American consumer goods). With the subtly of a highway building board sign, her work is populist and inviting; a counterpoint to Gates’ mesmerizing but reserved swirls of tar and 20-foot-hight walls of slate roof tiles. Color(ed) Theory is recapped in the show and is accompanied by a new video from Spirit of Space. It’s shown on two synchronized monitors, depicting Williams’ walking past shuttered storefronts of South Side streets, admiring their compositional verve, a block-color triad of purple, yellow, and green. Williams’ work celebrates the dingy but exuberant vernacular of painted brick and bodega signs. While one monitor shows scenes of neighbors painting a Color(ed) Theory house a reddish-orange hue of “Flamin’ Red Hots,” another shows a lone crane shovel excavator demolishing it. There’s a blunt message there: creation happens in community; destruction is a lonely, solitary act. But the color William’s exhibition is most interested in is gold. Quoting the rap group Dead Prez, her installation “A Dream or a Substance, a Beamer, a Necklace, or Freedom?” echoes the song’s assessment of the zero-sum game between material luxury and economic and political empowerment. The piece covers a rectangular area boxed in by gallery walls from floor to ceiling in gold leaf, but blocks views and access to it, save for a vertical slit less than a foot wide; wealth and good fortune just out of reach. “It’s a Goldmine/Is the Gold Mine?” wraps a stack of bricks—previously worthless as components of someone’s home—in gold leaf. It’s a tired variation on the alchemical transfer of value that happens whenever found and devalued objects, like bricks from demolished houses, are put on a museum pedestal. But it succeeds in setting up a critique of value systems that prize wealth and superficiality over the concerted, slow, and not-always-attractive grassroots efforts that Williams’ work epitomizes. Maps are another major theme of the show. In a series of eight works of cut paper, Williams layers Chicago’s relentlessly rational street grid with the outline of Iraq and the meandering Tigris and Euphrates rivers, where civilizations were born. William’s isn’t the first to compare these two venues for evening news body count statistics. In 2012, young people dubbed Chicago “Chi-raq” for its prodigious rates of gun violence, and Spike Lee made a movie of the same name. But the piece’s clarity of synthesis makes it one of the show’s strongest. The most transformative echo of the Color(ed) Theory series is wood box made from the remains of the house painted in a “Crown Royal bag”–shade of purple. A child who lived nearby (one of the last families on a largely vacant block in the Englewood neighborhood) grew attached to the house, and worked with Williams to turn its remains into a toy box. It’s a crudely crafted thing, but there’s a sense of love and intimacy to its rough edges and canted angles. At the MCA, it holds Matchbox cars, but its metaphorical ambition is greater: it’s a reliquary of sorts; a place to put the hopes and ambitions of the generations of children who will inherit forgotten places like Englewood. Another piece riffs on the idea of a shrine more directly. “Reliquary I: To unlearned people this may seem to be full of nothing and void of humanity” consists of the street grid of Englewood folded into a gable-roofed shape, reminiscent of traditional vessels used to hold sacred remains. The assertions that good things happen in places like this, and that those things deserve nurturing, take on a new urgency today, as Chicago is under siege from those relegated to underclass status, and from a president that uses them as a tool to bludgeon his enemies, whose tweets depict Williams’ city as a lawless scourge that must be brought to heel. Given these threats, the loud, bright colors of Williams’ exhibit—and the way they can draw a mass audience into the conversation—are just what’s necessary right now.